FEATURES * This Digital Dissolved Oxygen Meter is supplied with a polarographic type probe with an incorporated Temp. sensor which serves for precise Dissolved Oxygen ( DO ) and Temp. measurement. * Applications for Aquarium, Medical research, Agriculture, Fish hatcheries, Laboratory, Water conditioning, Mining industry, Schools & Colleges, Quality control... * Heavy duty dissolved oxygen probe, probe head size can connect with BOD bottle * All in one Pen type Dissolved Oxygen Meter, easy operation. * Automatic Temp. compensation from 0 to 50 ℃ for sensor. * Microprocessor circuit assures high accuracy and provides special functions and features. * Multi-display, show Dissolved oxygen and temperature at the same time. * Build in temperature ℃,℉ measurement. * Temperature unit can default to ℃ or ℉. * LCD with two display, easy readout. * Auto power off to save the battery life. * IP-67 Water resistance. * Records Maximum and Minimum readings with recall. * Data hold function for freezing the desired value. * Use the durable, long-lasting components, including a heavy duty & compact ABS-plastic housing case. 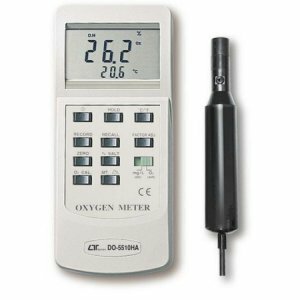 FEATURES * This Digital Oxygen Meter is supplied with a polarographic type probe with an incorporated Temp. sensor which serves for precise Dissolved Oxygen ( DO ) and Temp. measurement. * Applications for Aquarium, Medical research, Agriculture, Fish hatcheries, Laboratory, Water conditioning, Mining industry, Schools & Colleges, Quality control... * Heavy duty dissolved oxygen probe, probe head size can connect with BOD bottle. * Separate probe with 4 meters cable. * Automatic Temp. compensation from 0 to 50 ℃ for sensor. * Microprocessor circuit assures high accuracy and provides special functions and features. * Multi-display, show Dissolved oxygen & Temp. at the same time. * Build in temperature ℃,℉ measurement. * Temperature unit can default to ℃ or ℉. * LCD with two display, easy readout. * Auto power off to save the battery life. * Records Maximum and Minimum readings with recall. * Data hold function for freezing the desired value. * Use the durable, long-lasting components, including a heavy duty & compact ABS-plastic housing case. FEATURES * Range : 0 to 20 mg/L x 0.1 mg/L. * LCD display, pocket size. * Automatic temperature compensation. * Data logger. * Separate probe, easy operation. * RS-232 interface, Record ( max., min. ) * Power : DC 9V battery or DC 9V adapter in. FEATURES * This Digital Oxygen Meter is supplied with a polarographic type probe with an incorporated temp. sensor which serves for precision Dissolved Oxygen(DO), Temp. measurement. * Applications for Aquarium, Medical research, Agriculture, Fish hatcheries, Laboratory, Water conditioning, Mining industrial, Schools & Colleges, Quality control... * Professional Dissolved Oxygen Meter. * The polarographic type oxygen probe with an incorporated temperature sensor, high precision measurement for * Dissolved Oxygen(DO) & Temperature measurement. * DO function, Automatic temperature compensation. * Records Max. and Min. readings. * Data hold. * RS 232 PC serial interface. FEATURES * The polarographic type oxygen probe with an incorpo- rated Temp. sensor, high precision measurement for Dissolved Oxygen(DO), Oxygen in air(O2) & Temp. measurement. * Heavy duty dissolved oxygen probe, probe head can connect with BOD bottle. * Automatic Temp. compensation from 0 to 50 ℃ for sensor probe. * Build in " % SALT " & " Mountain Height " compensation adjustment button. * Microprocessor circuit. * Records Maximum, Minimum value. * RS 232 PC serial interface.